Are you ready to purchase a home solar power system? Have you considered your options yet? At West Coast Solar, we help homeowners determine their renewable energy budget, how they will purchase their system, and then help them make the purchase. Not only do we design and install solar energy systems, but we also assist our customers through the financing process. In this post, we’ll share the various purchasing options for residential solar power systems that homeowners can use. In part two, we discussed solar power potential, and in part one we offered some ways to determine the energy efficiency of a home. 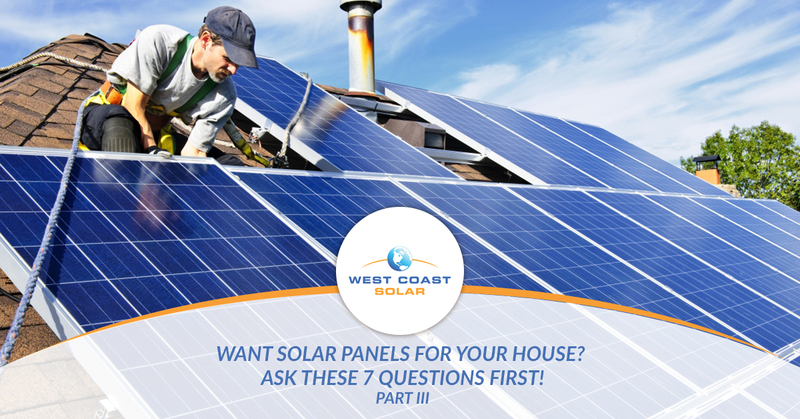 If you’re ready to get started on financing your system, give West Coast Solar a call today! We’ve been servicing residents in Sacramento for years, and we’re available to help you! Otherwise, continue reading this blog series to learn more. Question #3 – What are your solar power system purchase options? The best option is to either purchase a home solar power system with cash or with a personal loan. This way, you either own the system or have only one entity to interact with in the event of financial hardship. Nonetheless, when you use cash or get a loan, you can maximize your long-term return on investment. In most cases (depending on your utility company), if you purchase a solar power system with cash or a personal loan, you will be able to sell excess energy back to the grid and gain a credit on your utility account. This means that you can use that credit to purchase energy from the grid or simply let that build up for a rainy day, literally. Slightly different than a solar power lease, a PPA allows for the energy user to host a solar power system and then pay for energy usage—typically, the host purchases power at a kilowatt-per-hour rate. In most cases, a PPA is created to take advantage of a system producing an excess of power, and the owner can make more selling the energy to nearby businesses and homes instead of selling it to the grid. Finance Your Home Solar Power System Today! When it comes to buying a solar energy system for your home, there a number of options to make the switch to solar. At West Coast Solar, we’ve helped hundreds of Sacramento residents find a way to use the sun to power their homes—and in some cases, their electric cars. In part two, we explored how to determine a home’s solar power potential. Continue reading this blog series to learn more! Are you ready to explore home solar system financing options? Give West Coast Solar a call today!